New Delhi: A Three-day International Yoga Fest , a Curtain Raiser for International Day of Yoga (IDY) 2018 was inaugurated by the Minister of State (IC) for Development of North Eastern Region, MoS for PMO, Ministry of Personnel, Public Grievances & Pensions, Dept. of Atomic Energy and Space Dr. Jitendra Singh at Talkatora Stadium, New Delhi today. In his inaugural address, Shri Jitendra Singh said that Yoga helps us in becoming strong which in turn leads to the creation of a healthier, more powerful and a happy family, society and nation. 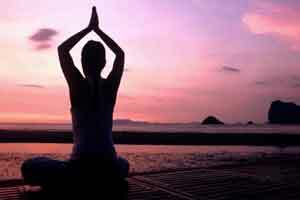 Shri Singh further said Yoga has now united the world for its appeal for a healthy life. He said that yoga has taught us to tackle stressful lifestyle but also old age ailments. Speaking on the occasion, the Union Minister of State for AYUSH (Independent charge) Shri Shripad Yesso Naik said that the ministry of AYUSH has recognised the potential of Yoga and all possible steps are being taken to promote it at all levels. Shri Naik said, in this age of tremendous change brought about by advancements in Science and Technology, there is need to bring about harmony between technology and spirituality. The Minister emphasized that Yoga is the answer to these challenges. He said, the Ministry of AYUSH is constantly working towards promoting Yoga and ensuring that it permeates to all aspects of society. The AYUSH Minister informed that many new initiatives such as the NCERT Yoga Olympiad, various awareness camps, international conferences on Yoga, publication of books on Yoga and starting of Prime Minister’s Award for Yoga have been taken. He said, the ministry has also adopted a zero-cost health assurance model to control dieases such as Diabetes. The Minister thanked the Yoga Gurus and Yoga Masters who are contributing to make it a people’s movement. Welcoming the participants, Secretary AYUSH, Shri Vaidya Rajesh Kotecha informed that this is the third international Yoga Fest organized by Morarji Desai National Institute of Yoga and the popularity of this fest has grown with each passing year. The three-day event is being organized by Morarji Desai National Institute of Yoga (MDNIY) to sensitize the masses regarding celebration of International Day of Yoga held every year. More than 5000 delegates including the eminent Yoga Gurus, Yoga Masters, Scholars, Policy Makers, and representatives from 16 countries are participating in this mega event. During the international yoga fest, parallel yoga workshops by eminent yoga masters and yoga gurus will be conducted. Besides, lectures/special yoga techniques/yoga demo by yoga masters, satsang/isha music/ discourses/cultural programs by eminent yoga gurus, yoga demo by the students of leading yoga institutions/yoga professionals are also being organized.